This new classic colonial home offers a lot of space as well as modern green features. The 6,079 square-foot home has five bedrooms, five full bathrooms and a powder room. The brick and beveled siding façade is the backdrop for an elegant center entry complete with alcove, stone front porch and walk. Drive up to the single car detached garage with semi-custom garage door. The rear of the house features an open air loggia with stone floor. 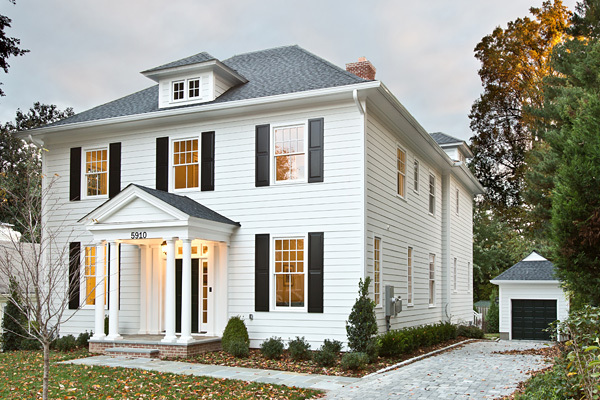 A brick chimney and architectural shingled roof complete the exterior. On site Underground Storm Water Management—storm water is redirected into a cistern system and recycled back into the irrigation system, reducing your water bill and keeping your landscaping watered at the same time. High Efficiency HVAC Systems with Programmable Thermostats. Special Material Siding creating Durability and Sustainability. 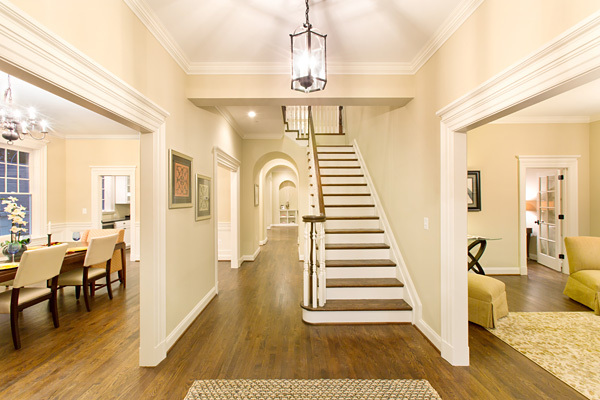 Upon entering the home, you’ll find ten-foot ceilings and oak floors on the first floor. The center foyer offers long sight lines and an antique brass chandelier. 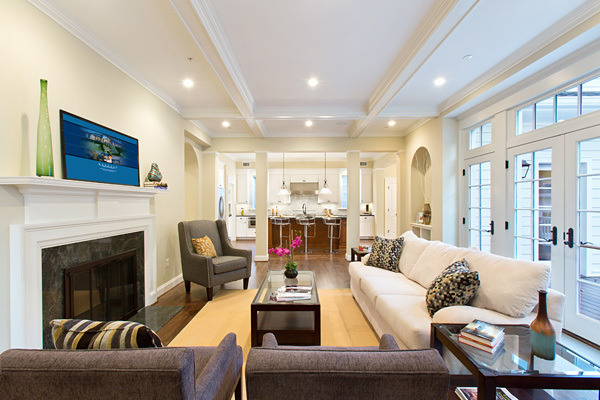 The living room, formal dining room and library are accentuated with two-piece crown moulding. 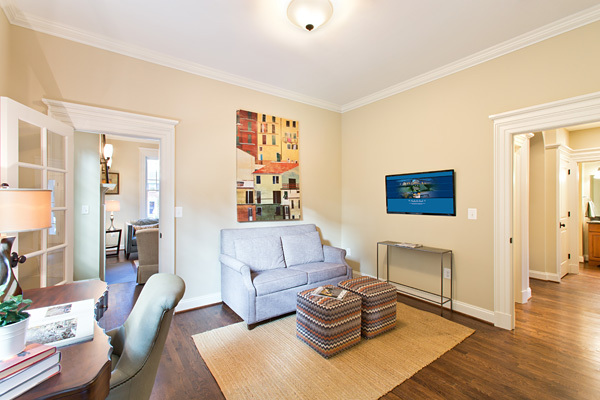 The living room’s focal point is a masonry wood burning fireplace with hand crafted wood mantle while the library is pre-wired for data, cable and telephone. The home boasts a true chef’s kitchen with built-in equipment by KitchenAid Architect’s Series, Sharp and Vent-A-Hood including a 36-inch wide, six-burner gas range top with a stainless steel commercial-style hood. Ideal for entertaining, it includes custom lacquered maple cabinetry, a stone countertop with custom backsplash and walk-in pantry with custom storage shelving. A butler’s pantry with built-in cherry cabinetry with mid-tone stain makes a beautiful transition between kitchen and formal dining room. The kitchen is framed with two-piece and pre-wired for data, cable and telephone. 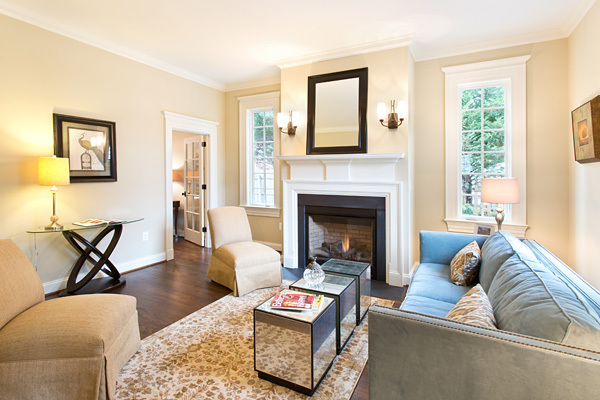 You’ll love lounging in the pleasant family room which contains a gas fireplace with stone surround and hand built mantle, antique lighting, crown moulding with a coffered ceiling and built-ins. French doors open to a large rear deck and the room is pre-wired for data, cable and telephone. 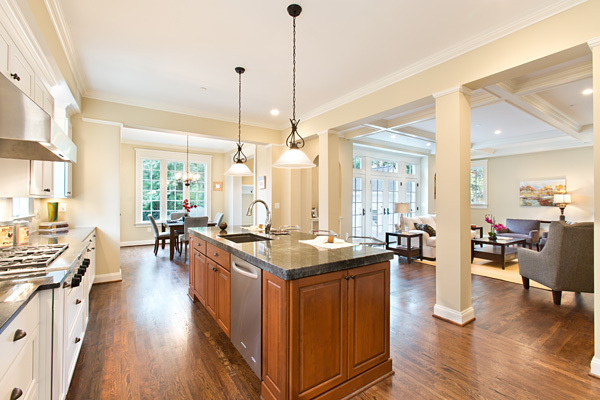 In addition to a formal dining room, a family dining room adjacent to kitchen overlooks the rear garden. It is adorned with a wrought iron chandelier and two-piece crown moulding. Finally on the first floor, a mudroom offers access to the rear deck and a boutique powder room features an antiqued painted wood and stone vanity, a wall sconce and silent exhaust fan. A coat closet houses all of your things. Climbing the handmade oak staircase to the second floor, you’ll find four bedrooms all with en-suite bathrooms and nine-foot ceilings. The baths are done with classic tile wainscoting, vanities with stone countertops, wall sconces and recessed lighting and silent exhaust fans. A large laundry room with built-in front-loading washer and dryer; cabinetry; sink; and counter lightens the load of doing laundry. 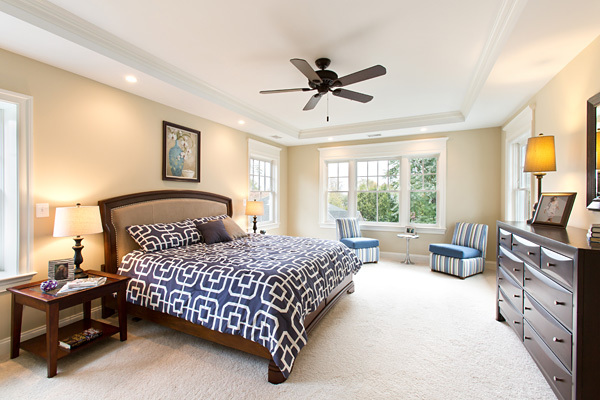 The master bedroom suite is a relaxing refuge with its coffered ceiling with three piece crown moulding, recessed lighting and massive walk-in closets with all built-in wardrobe accessories. It is pre-wired for data, cable, telephone and security. Similarly peaceful, the master bathroom is marble with coffered ceiling and two piece crown moulding. It shows off antiqued painted wood and stone vanities; a shower with frameless glass door, bench, multiple shower heads and handmade marble shelving; spacious soaking tub; and separate water closet. It is completed with wall sconces and chandelier, recessed lighting and silent exhaust fan. 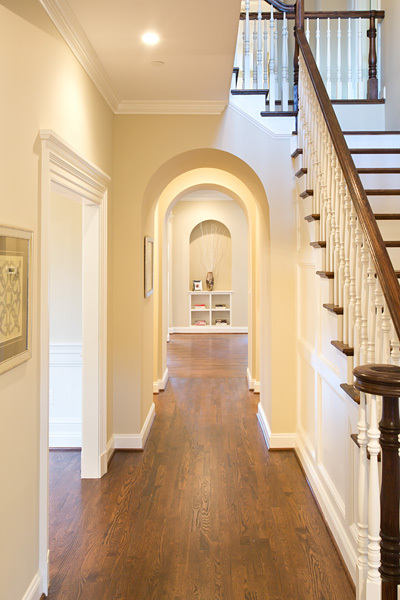 Second floor hallways have recessed lighting and open to the first floor center hall. The finished basement adds another bedroom with large walk-in closet; a second family room; and a media room. All are pre-wired for data, cable and telephone. A full bathroom is done in classic tile wainscoting and features a tub with shower, vanity with stone countertop and silent exhaust fan. The final features include a large storage room and mechanical room filled with work by master craftspeople whose work is a show piece worthy of this home.